In their desperation to deny the impact of global warming on Arctic sea ice, fake skeptics like Anthony Watts, Marc Morano, and Steve Goddard have gone out of their way to blame this year’s crash dive on the weather. In particular, they want to blame it all on the Arctic storm in August. Apparently they don’t get the difference between weather and climate. Let’s help them out, shall we? If you look closely at tamino’s two charts you can see that a new record has always been set in a year when the weather noise gave a negative residual – ie the weather gave the trend a helping hand. This isn’t really that surprising, because the size of the residuals can be quite large, sometimes more than 0.5 in either direction, and so the noise from year to year in the weather can be as much as five years worth of the recent trend. Where the trend becomes obvious is if you look at what happens in recent years that don’t set records, when the weather did all it could to prevent sea-ice melt. Every year since 2007 set a record compared to the years before 2007 – what was exceptional becomes normal. 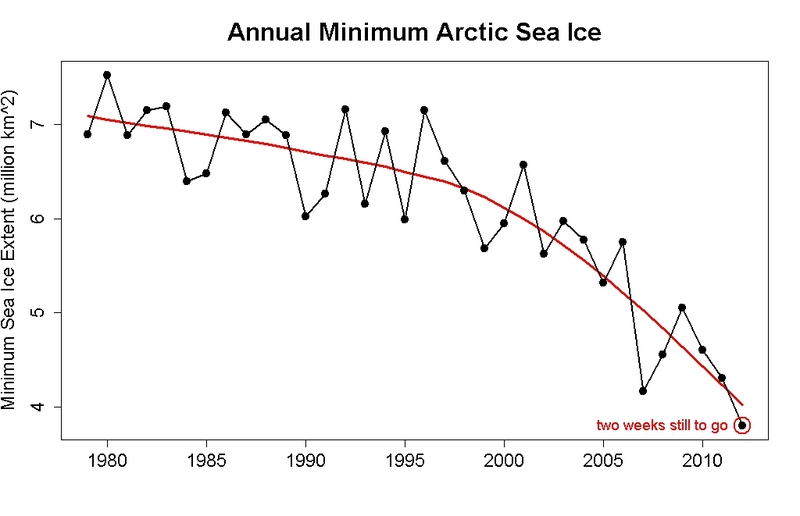 I would estimate that we will now see at most two seasons where the minimum Arctic extent is greater than 2007, and it could easily be fewer than that. Those times are fast receding. This is same as blaming a record global temperature year on an El Nino. You dont expect a temperature record in a La Nina year. The climate bit though is making a La Nina temperatures warming than El Nino’s of previous decades. 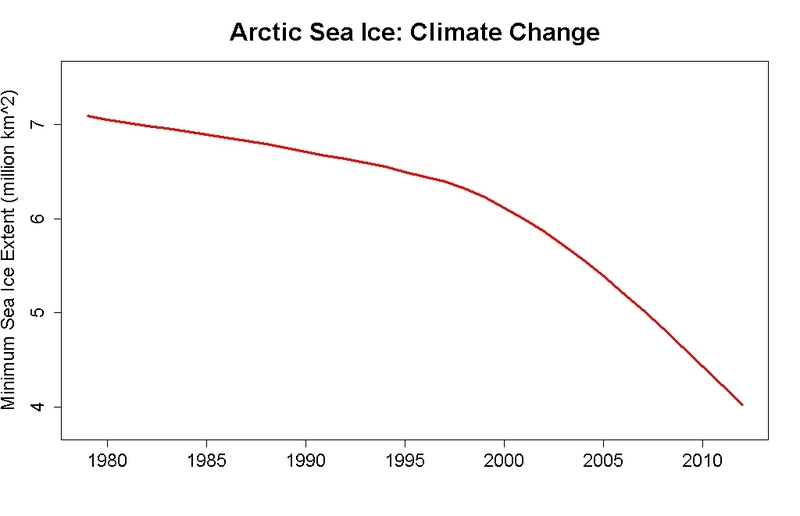 What we can expect for the arctic is continuing downward trend, but that new records will happen in bad weather years. … And a big reason it wasn’t setting records before June 8 is that a large (actually, a record large) anomalous sheet of ice formed in the Bering Sea this winter, artificially propping up the sea ice area value. You could almost think of the sea ice as being like a house being eaten away by termites. Year after year pieces of the house are falling off but then one day a big storm blows through and takes down half the building. It’s still the termites causing the damage, the storm merely hastened the collapse. To say the storm caused the collapse means you’re just avoiding the obviousness of the termite problem. I’m not an expert but I think this is what’s been happening with the ice and what gets missed in all the satellite data measuring area, extent and volume. You don’t get a good measure of the actual quality of the ice. This year’s storm merely tells us how much of the degradation of the ice we’ve been missing. Might have to change it to “thermites” for the sea ice case, if’n you don’t mind. Horatio gives you credit for the inspiration on his website. Thanks again for the really great image. Jeffrey Davis made exactly the same point that I was going to make. All that the storm did was to bring forward a minimum that would have occurred anyway, in the absence of the existence of any weather at all. Such absence is not a real situation, and and it’s salient to point out as others have that the record breaking would have occurred any, just at a slightly higher extent. Blaming the broken record on the weather simply demonstrates the statistical/mathematical innumeracy of the Denialati. And since there will always be an ‘occasion,’ there will always be an excuse for the likes of Watts. Luckily, it will be easy to recognize as a very lame excuse. If you truly want to see such a “Rogue’s Gallery,” surely all you need to do is to orbit planet Wattsupia a few times where the posts all pretty much suffer from one howler or other. But it is not as simple as a list of links if you want a useful “Rogue’s Gallery”. Improved methods for rubbing denialist noses in their own mess would probably require a catalogue of some sort – such is the quantity of mess they produce even at an individual website like planet Wattsupia. The real culpable mess at Wattsupia however is a little less ubiquitous than the general nonsense. For instance, general-nonsense-wise how would you catalogue the 4 links MMM provides here? However jubilant and nonsense-filled the style, reporting that the Arctic Sea Ice Extent had approached ‘average’ levels in the freeze of 2009/10 is not the work of a ‘rogue’ per se. The predictions of ‘average’ ice levels continuing into the 2010 melt season was less excusable (i.e. taking liberty with a trust although not really breaking it) but any prediction is surely allowable. You can only be right or wrong & here Wattsupia is wrong, stupidly so. Yet being stupid is the accepted modus operandi for these denialists. N#0001 Watts predicted in early 2010 repeatedly (but not as he asserted in Sept 2009) that 2010 would see a third year of recovery following the Arctic Ice losses of 2007, ridiculing those who said otherwise with the quote “Science is the belief in the ignorance of the experts.” Watts was entirely wrong in his prediction & the ‘ignorant’ experts were entirely right. The only culpable stuff I spotted in the four posts was in talking Walt Meier’s “local” Bering Sea winds and using them to mean pan-Arctic winds. Out of 4 posts (two not WUWT), that doesn’t really amount to much culpable error. Is that typical for planet Wattsupia? Compare that with Wattsupia’s latest offering – a guest post from Monckton. Here the entire thesis rests on 2 gross errors (Eqilibrium Sensitivity=\=Approximated Transcient Sensitivity@350ppm=\=Approximated Transcient Sensitivity@550ppm). It would take a moron not to notice these errors but Watts publishes and makes morons of his visitors. 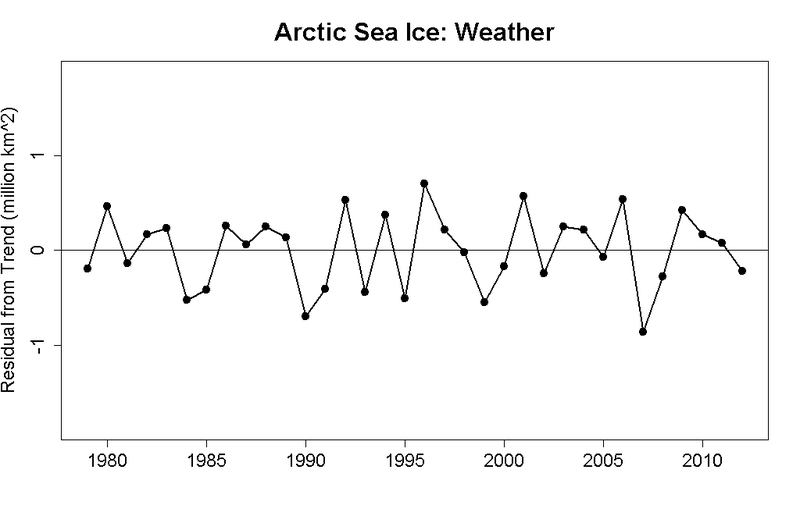 When the Arctic sea ice melted in 2007, that was weather because the climate models predicted ice. Same for 2008 and 2009. In 20010, we had a history of the same weather in the same region in the same season for 3 consecutive years. At that point looking at the climate period from 2000 to 2030, large scale sea ice melt is established as expected weather, and hence part of the climate of the Arctic. After 6 consecutive years of the same weather in the same place in the same season, we have to say sea ice melt is the climate in the Arctic and it is as predictable as tornadoes in “Tornado Alley”. And, sea ice /sea ice melt directly affects the weather in the US (i.e., Irene, drought, Isaac). Weather is driven by the total amount of heat in the system – however it got there. That affects agriculture, in the NH and the SH. That affects food and fuel. That affects required services. That affects the economy, jobs, government and institutional debt. We cannot plan for better a better economy unless we address AGW. Any leader that does not address AGW, does not have a viable plan for – anything in the future, because AGW affects the future of everyone and everything. The time frame is NOW!, and the location is global. Any leader that does not plan for AGW is going to get blindsided by weather and climate that is outside of their experience, and they will fail. I request everyone to ask all candidates what their plans are for the weather and agricultural emergencies resulting from AGW. Man from the Future, do you have a record of who won the NCAA tournament in 2013? Rob, most people don’t get the nuance of the difference between proximate and ultimate causation that your analogy aptly illustrates. Including more than a few scientists doing D & A on extreme weather events! You may think it is hilarious, but Steve Goddard wasn’t amused. He banned me from his science fiction blog for posting a link to that video. I can just imagine how Willard Watts reacts when he finds out that he is the victim of that video. Brilliant! 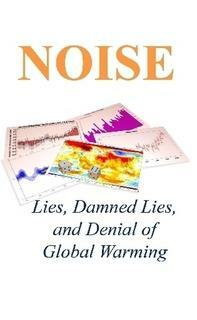 It nicely portrays AGW deniers as the bunch of clowns they really are. Absolutely brilliant! Made my day. I want to see the movie-length interpretation in the cinemas! We need more of this. Folks need to know that one really effective way of responding to these folks like Watts is through parody and satire. Re-posted with glee. Other climate elves will spread it far and wide. That’s hilarious especially the part about elves. Just curious… what are you using for a trendline? While the population lingers at close to critical mass, a single event or sequence of events could drive it to extinction – a drought, a flood, a disease outbreak, an oil spill …. A long term trend accentuated by the peaking of some natural variable. And another thing worth noting Toby is that the extinction debt can be incurred long before the debt is actually recalled. In other words, that threshold can be passed, but the species can linger for quite a while before nature forecloses. Sometimes humans can try to repay some of the debt with captive or other breeding programs, but loss of genetic divesity makes this ‘repayment’ one done with funny money, and thus predicated on the hope that nature is satisfied with playing with Monopoly cash. I recall that cheetahs are a near-example; DNA analysis shows an extreme lack of genetic diversity. The inference is that the population managed to recover from a near-extinction event. Of course, the future could still ‘collect’ on that debt, particularly since the lack of genetic diversity presumably is a form of potential adaptive inflexibility, and thus a lingering ‘weakness’ in the species. Cheetahs are one good example Kevin. Add to that list animals such as Tassie devils, black-footed ferrets, Calfornian condors, and so on, and you’ll eventually end up with a depressing list of iconic species that would/will rapidly evaporate if and when humans do not have the resources to continue to counter natural pressures driving the species toward extinction. Of course, not all animals are vulnerable to genetic bottlenecks. Think of rats, aphids, Indian mynahs – that list goes on too. There are a number of features that differentiate species’ varying vulnerabilities to bottlenecks. Generation time is one: short times permit the accumulation of mutations (both positive and negative) that might reintroduce some genetic diversity; and they also permit a species to recover quickly from stochastic assaults, before something else might come along to pressure the population. Another is the very inherent adaptation of certain species to boom-bust cycles where bottlenecks are an integral part of the species’ life-history. Closely related to this is the nature of niche utilisation – generalists vs specialists – with the former usually being much more resilient to decline in genetic diversity. There are more, but we’re wandering far away from topic, so I’ll cease and desist. …which brings us back to what is happening to our planet’s climate. Thanks for the elaboration, Bernard, off-topic though it may be. This might be a good place to drop a link to that screenshot. Not a chance. That would require cognitive ability that they don’t possess. Thanks Tamino for your great contributions. This great cyclone was neither rare nor a game changer. Sea ice converges towards the center of a low, consolidates looser ice, off which might have been mistaken as a melt. It was a simple weather event. We have had occasional cyclones lasting much longer in the past. The big weather events was the overall cloudiness of the arctic during the entire summer not stopping the ice from melting greatly. However WUWT gang will likely blame this storm because they have nothing else to hang on to. So a low which went against the gyre current (reducing flushing in Fram Strait) , a low as common as snow in the Arctic is the culprit! lol…. No, sea ice diverges from the center of an atmospheric low pressure system. A low pressure center in the atmosphere tends to move a surface (Ekman) layer in the ocean (and materials embedded within in it such as sea ice) towards the right looking in the direction of the wind (northern hemisphere). The net of effect of a closed counter-clockwise wind (low-pressure system) is to loosen the ice, as it causes a divergence at the surface of the ocean. The frictionally dominated flows in the (bottom) boundary layer of the atmosphere are in the opposite direction as the frictionally dominated flows in the (surface) boundary layer of the ocean. The balance of forces is between frictional stress, pressure gradients, and an apparent Coriolis force associated with an observer fixed in a rotating (rather than inertial) system in both the atmosphere and the ocean. Andreas, I judge the effect of a Low by its surface winds, whereas the ice largely flows in its direction. How interesting to read that it does not. It is not observed as such. The wind around a low near the North Pole has near Maximum Coriolis effect of which it tends to break the surface isobars towards the center of the low. If the wind around a low behaves as such (as it should) then the ice will compress towards its center. The opposite is true with Anticyclones, whereas in the middle of winter even with Maximum Ice extent, open water can be created at Vicinity and edge of a strong High pressure. Low pressure systems may cause the mixing of open water which may increase melting. But the idea that the ice diverges away from a low is quite interesting, but not in line with pressure gradient wind dynamics. wayne, Dr. Muenchow is right. The question puzzled me, actually, and we had an extensive discussion of it over at Neven’s Sea Ice blog. The classic Ekman drift theory (that surface water velocity drifts 45° to the right of the wind direction) is modified to be 50.4° on the ice-covered Bering Shelf due to the year-round existence of a background northward ocean transport. MMM is worth posting!!! by all means, show them bragging about sea ice recovering. A compendium of contrarian sea ice predictions is exactly what the media needs to see. Seems all my posts have now been “disappeared” over at Steve Goddard’s site. I’m batting 2 for 2 as both Goddard and Watts have now directly or indirectly banned me or otherwise made sure I didn’t upset thier band of faithful bobble-head followers. As the noose tightens around their denialist world views, I guess they want to make sure the final hanging is in private without the uncomfortable intrusions of truth. I will condensate what I just wrote a little more, I didn’t explain the coriolis effect well. The overall impact of ice movement is the net result from direction vectors, of which wind is merely one of many, there are Tidal vectors, momentum, coriolis, wind, sea current. The wind is the dominant directional vector especially when it is very strong, so where-ever the winds blows the ice usually follows, the coriolis effect is but one of many factors. Around a strong cyclone if the wind tends to go towards the center of the low then the ice will do likewise. R. Gates, No need to comment on their websites. But a collage of predictions they make would be fantastic! They usually fail with their predictions constantly because their made up beliefs interfere with proper scientific reasoning. It is therefore useful to show how good they actually are. Anything special about the storm that Watts credits with the record-breaking sea ice retreat? Not according to Wattians as it was raging last month. Bill Illis – “The big melt this year occurred in 3 waves. The first in late-April, the second in early-June and then in early August when the storm hit lasting until today really. No, there’s nothing unusual about the weather until an excuse is needed. None of these commenters questioned Anthony’s take. That’s how they roll at WUWT. I was banned on my first post at wacky Willard Watts pseudo-science blog for having the temerity to ask Chris Monckton why he is avoiding the debate with Peter Hadfielld .I understand that Watts sends all comments that mention Peter Sinclair and Peter Hadfield, down the memory hole, Whats up with that? Steve Goddard banned me for posting a link to the video in my upthread comment , then the SOB posts the same video on his blog 6 hours later. It would be helpful to have an arctic-only temperature anamoly product. I have in mind one for the Artic Ocean, not the entire polar region. There’s always this index from UAH. Oh, can’t you see recovery after? And find a time that’s cold and numb? The only saving grace of the Posseidon Adventure is that there was only one movie. If I may be so bold – here is an animation I helped coin for a Norweigian TV-show that tries to illustrate chaos and trend (or weather and climate) – more illustrative than absolutely true since we can imagine that the dog pulls the owner into a different slope in periods (imagine multipe El-Nino years as a percistent “dog” for example). The trend is thus not as fixed as the owner may indicate in this video. Yet the basic point remains.